This month the K’Tizo Tea newsletter had a British focus so I thought it is time to bring some clarity to the term”Tea” as it is understood when in Britain. The term tea in Britain may refer to the leaf, the beverage or an event. I will focus on the British understanding of the event called Tea. This month K’Tizo Tea has had an added British touch from Heather, our marketing intern who is visited the UK this month. She has sent periodic photos of her cultural adventure. Check out our Facebook photos for a beautiful rainbow shot at Oxford! “Tea” as an event is accredited to Anna, Duchess of Bedford in the 19th century. Since dinner was served late she wanted to fend off that sinking hungry feeling. She began serving tea, cakes with bread and butter, eventually inviting friends and the popularity grew. The 4pm Tea helped all to finish the day well. 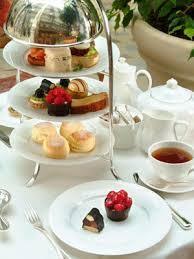 Light sandwiches, scones and biscuits (cookies) accompanied by a variety of black teas is a common menu for “tea”. With the growing popularity of tea, the 21st century has expanded the tea menu, to include Green, Oolong, White, Pu’erh teas and Herbal & Rooibos. High Tea means different things to different people. I had thought for years it was a more formal tea until doing research on the topic. While the Afternoon Tea was the practice of the rich in the 19th century. Workers in the newly industrialized Britain also desired a ‘Tea’. Their tea included a more substantial meal than just tea, finger sandwiches and cakes. Workers needed nourishment after a day of hard labor, so their ‘tea’ was often hot and filling, plus a pot of good, strong tea to revive sagging spirits. The term “HIGH” referred to the chairs and table the tea was served on. Afternoon Tea was served on low parlor chairs while High Tea was served at the ‘higher” table and chairs. This meal may also be referred to today as supper in the working class home. In Scotland, my father-in-law’s place of birth, the High Tea is often accompanied by meat-pies. Another name for High Tea is Meat Tea. These delicious treats provide a heartier meal. 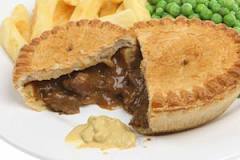 Savory pies are quite delicious and growing in popularity here in the States. 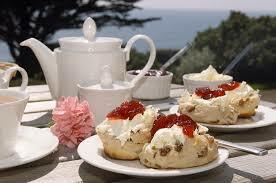 There is dispute as to whether the Cream Tea originated in Devon or Cornwall both in southwestern England. (Since 2010 there has been steps take to obtain a Protected Designation of Origin (PDO) in the European Union to protect the Devon Cream Tea). 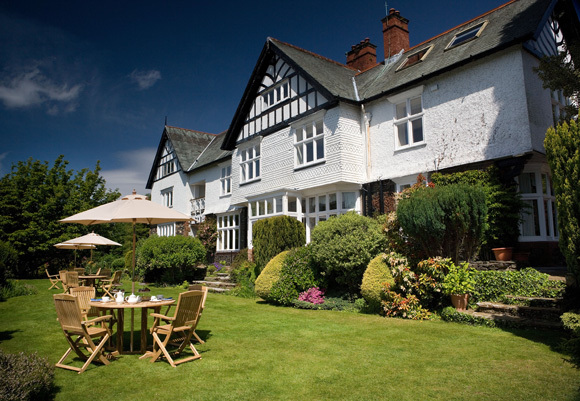 When we visited England in 2010, my family and I enjoyed a lovely Cream Tea in the Lake region on a patio overlooking beautiful (Lake) Windemere. (The term mere at the end indicates it is a lake). If you have the chance to visit the Lake region it is quite picturesque plus it is filled with a rich literary heritage as well as Tea Rooms! 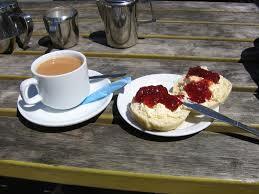 A Cream Tea includes clotted cream, scones and jam served with a pot of tea. When I went to my first Cream Tea I did not know this and wondered where were the tea cakes and sandwiches. Plus, I found the cream so rich I wondered if it was a whipped cream that should be added to the tea. Of course the attended smiled and said as you wish! Often at a Cream tea other refreshments are typically available to order if your spirits are sagging and you need a bit more refreshment. Traditionally clotted cream was created by straining fresh cow’s milk, letting it stand a cool place for several hours, this allows the cream to rise to the surface. It was then heated it over hot cinders before a slow cooling. The clots that had formed on the top were then skimmed off with a long-handled cream-skimmer, known in Devon as a raimer. 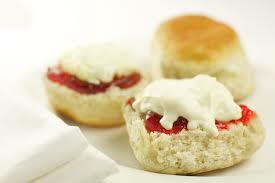 Today there are ‘more modern’ ways of allowing the clots of cream to rise and then be removed from the milk. One is referred as the “float method” and the other the “scald method”. I trust you are now inspired to have your own tea “the event” tradition. What better way to refresh sagging spirits then with a delicious cup of hot tea and a light refreshment. Scones with jam and cream always give that extra touch of tradition but it may have been a hard day and you need a bit more sustenance, either way do not forget how refreshing tea is and select one of your favorite K’Tizo Teas to accompany your tea event!